You can use our Adobe pdf order form and mail in to our Apostolate. You can type in the form, print and mail. Click here to view the form. Our Apostolate is dedicated to the Queen of Heaven and Earth, our Heavenly Mother. Her Immaculate Heart leads souls to find her Son, Jesus Christ. The Green Scapular is an approved "Sacramental" of the Catholic Church. The specific graces associated with them is "Spiritual Conversion" and "Physical Healing". 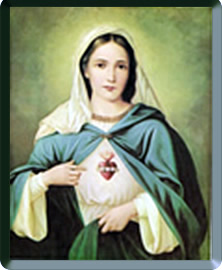 The inscription on the back of Mother Mary's green scapular says: "Immaculate Heart of Mary, pray for us now and at the hour of our death." We invite you to recite this beautiful prayer daily. Jesus Christ blessed this Apostolate! Jesus asked Anna Marie to: "Bring My Mother More Souls". We continue to do this daily by sending out a "free" blessed Green Scapular Kit (GSK) to anyone requesting it. That person is instantly consecrated to Jesus, through His Mother's Immaculate Heart. It doesn't matter if that person does not attend church or the sacraments, Blessed Mother will visit that person whose name you wrote on a blessed Green Scapular and let the demons attacking that person know that she is claiming him or her for eternal live in Heaven. Usually no one knows that Mother Mary is visiting, but she does. As any mother would do, our Heavenly Mother will then go to her Son, Jesus, and ask Him to save that soul from damnation. She takes all our prayers and uses them to bring conversion or healing to the person who you wrote on a blessed Green Scapular. That is why we are a "network" of prayer. Almighty God dictated the Eternal Consecration Prayer to Anna Marie in 1997, and we ask all Apostles of the Green Scapular to recite this prayer once so that their prayers (Holy Mass, Rosaries, Chaplets) are given to Mother Mary who helps dispenses graces to others in need. When a person who had his or her name written on a blessed Green Scapular dies, he or she will be sent to Purgatory. The Lord's gift of redemption has been placed on these blessed Green Scapulars. On the first September 27th, the Feast Day of our Patron Saint, St. Vincent de Paul; he or she will be taken from Purgatory and enter into the Kingdom of Heaven. Two Angels from Heaven delivered this to Anna Marie, as a gift to Anna Marie for the work she and her prayer group had been doing, trying to save souls from hell. We invite you to recite the Novena of St. Vincent de Paul which begins every year on September 19th thru 27th. Please attend Mass and celebrate your loved one who has been received into Heaven. 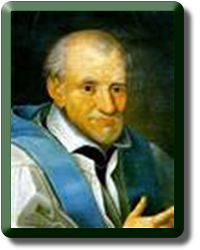 We now offer the Novena of St. Vincent de Paul in Espanol too. Visit our Contact Us page to order your "free" blessed Green Scapular Kit online (quickest way to contact us). You can also order by mail. If you open our Mail In Order Form, you can type into the pdf fields and mail it in. 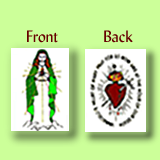 We will no longer open any Green Scapular Kit order forms via email, so please mail it to us via postal services. To contact us via email, membership@greenscapular.org. Thank you and God bless you!